Michael Bates, perhaps better known as Mick, was never a man that was pushy, he never want to be the limelight of events. A somewhat shy man in many ways, who thought things out before answering. As often said, he engaged his brain before opening his mouth. He had a very logical mind. I first met Mick when the Britannia G-ANCF arrived at Speke Liverpool for restoration. He had taken the aircraft apart in the eighties being employed by Proteus Aero Services. He was very involved in this work; it eventually became his big aim in life to see it restored back to look like it did in its flying days. He was an inspiration to work with. A man that had and expected high standards in putting the aircraft back together again. He was planning to be up at Speke during the week that he passed away. His love of mechanical things was obvious to all. He would recall the days when as a boy he would be found either standing at some railway station or goods yard doing what boys always did, collecting numbers or trying to get a footplate ride around the yard. Or as a youngster he could also be found at an airfield watching aircraft. He would frequently visit Denham or Southend airports It was these time at the airports that were to move him to become an aircraft engineer. In 1960 he started life in aviation with Tradair on Vickers Vikings. He worked for a number of airlines including Autair and BKS. 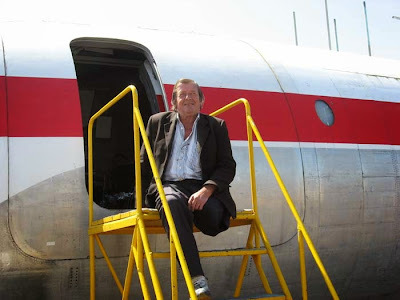 In the seventies and eighties he became a loadmaster on his beloved Bristol Britannia, flying the all over the world. His fame as an aircraft fitter became well known and was soon requested to join the staff of Proteus Aero Services and was to work with Roger Hargreaves. 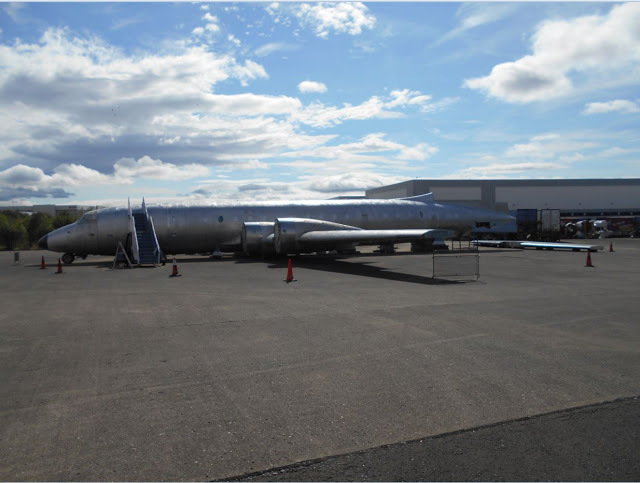 He was actively involved in the repair and relocation of two of Brooklands aircraft, the Viscount (G-APIM) and the Varsity. The Viscount required a large amount of repair work as a result of an accident and then being taken apart for transporting to Brooklands . Not to be forgotten is the preparation for transport and restoration of the H.P. Herald at Woodley. A quote from Flypast magazine regarding the repair of G-APIM "Mick Bates was to give long hours in basic conditions affecting some repairs to the nose of the aircraft and then dissembling it for transportation. During his visits to Speke he would fetch out of his famous wheel chair bag, photos that he had taken of Aircraft and locomotives. There was always a story that followed. He loved to talk about what he would call 'real' aeroplanes. The Viking, Britannia and Viscount were amongst his favourites. In these past few years he did not enjoy good health, he battled through various personal sadnesses and medical problems. The loss of a leg was a real blow but as our chief engineer for the Britannia project he was an inspiration to us all, in so many ways. He never allowed his disability to get in the way when attempting work on the Britannia. He would climb the passenger steps get back into his chair and then to work. Sometime balancing on one leg to reach a rivets using the rivet gun. 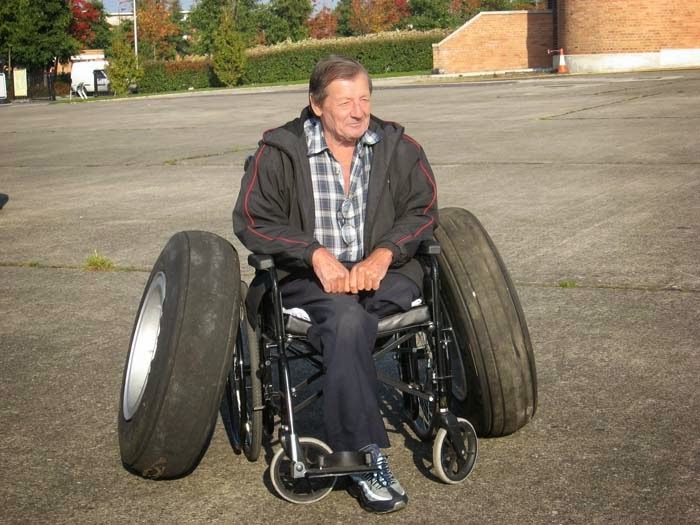 His memory of how he took the aircraft apart and the way it should go back was incredible. Mick will be greatly missed by many. We who are left to continue the Britannia project are going to find it hard. But it is our determination to complete the task to the memory of our friend and colleague Mick Bates. To do this we need help. So if you are an airframe man especially with riveting experience and feel that you would like to assist in this project then please contact us. on Thursday 8th April 2010 at 3.30pm.